A good record is a melting pot of a lot of things. You’ve got your bread and butter in the musicians and composers. Then, you’ve got the salt and pepper with recording and mixing engineers. But there’s always that extra spice that so many have trouble putting their finger which can make the dish magical. In the case of recorded music, that secret ingredient is mastering. 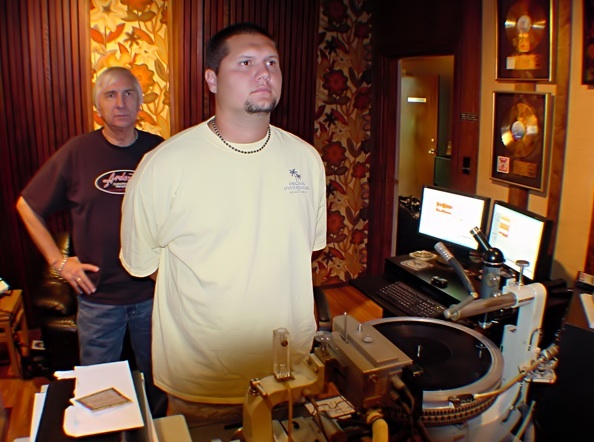 This past week, I had the chance to sit down with Kevin Nix—one of Memphis’ most prolific mastering engineers about his work, history, and the magic he puts into every song. Mastering Engineer Kevin Nix is half of L. Nix Mastering. The company name is derived from Kevin’s father, Larry Nix, who started out as the house mastering engineer at STAX Records. When Stax closed its doors in 1975, Larry opened shop in Ardent Studios. He’s mastered countless records over the last 40 years. In 1994, Larry brought his son Kevin on board. Together, they are one of the most sought-after engineering teams in the world. A recent client list includes Three Six Mafia, Lucero, North Mississippi All Stars, Huey Lewis and the News, Big Star, and The Bo-Keys (to just name a few). Recently, producer Dennis Herring (Modest Mouse, Counting Crows, Elvis Costello, Wavves) stopped by to have a mix mastered. This Manning-esque family dream team lays claim to a large clientele list that spans the world over. But this behind-the-scenes occupation wasn’t always what Kevin had in mind. After Nix got a grip on things and learned the art of mastering from his father, it wasn’t long out of the gate before his first major work. In the mid ’90s, Kevin got his hands on an R&B legend Jonnie Taylor’s track “Good Love.” After mastering the pop hit for the soul icon, Kevin got his first taste of working in the business. Throughout the upcoming years, Nix would keep busy working with several very successful artists. Yo Gotti, Juicy J, and many more would keep the phone ringing and the Nix resume growing at a steady rate. Through this effort, Kevin Nix developed a relationship with several of Memphis’ hip hop elite. Up-and-coming director Craig Brewer was finishing a film based on the harder side of life that parts of Memphis host. Kevin got tapped for mastering the work of Al Capone, Three 6 Mafia, Nasty Nardo. Although Kevin Nix comes with years of experience under his belt and notable names crowding up his resume, his head stays level and his feet stay on the ground. As modest as he is talented, Nix keeps any and all pretensions at bay, even when people come in with the wrong idea. Kevin Nix continues his work daily in a comfy well-equipped room in Ardent Studios. Keep yourself updated with all things related to the mastery of mastering at his website.